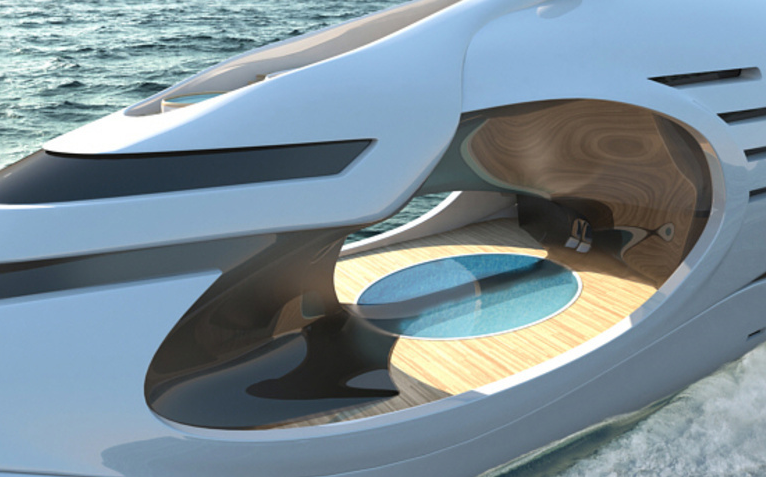 Overview: Infinitas is the 300 foot (91.5 meter) yacht concept. The design’s main inspiration comes from the symbol for infinity which has been abstractly expressed within the yacht’s elevation. The design’s main inspiration comes from the symbol for infinity which has been abstractly expressed within the yacht’s elevation. There are three methods to traverse the pool deck. First is a direct outside bridge / walkway which bisects the pool itself. This walkway has underwater openings in its support system, allowing swimmers to dive from one side to another. The pool has the option of being covered for larger venue needs. Infinitas is designed to accommodate 16 guests and crew.